What an exciting idea, that what we thought was immutable is actually mutable! Unfortunately, to read the rest of this article requires a subscription to New Scientist, which I don't have. So I did the next best thing -- I found two other articles about the physicist referred to, Claus Rolfs, the first describing Rolfs' ideas, the second by a fellow physicist who considers Rolfs' ideas fallacious. Time will tell who's correct. There's nothing you can do to hurry radioactive decay, the textbooks will tell you, but New Scientist meets a physicist who begs to differ. For all its eureka moments, science has taught us many unpalatable lessons about what we are powerless to do. We can't dim the sun to remedy droughts or global warming. We can't stave off the ravages of time to live for thousands of years. And there's little we can do about radioactive waste from nuclear reactors that will be a health hazard for generations to come. Radioactivity cannot be tamed; all we can do is bundle the waste somewhere safe and wait for it to decay away. So it takes some nerve to say otherwise, and suggest that there are, after all, ways to speed up radioactive decay. The technique involves embedding the nuclear waste in a metal and cooling it to ultra-low temperatures. This speeds up the rate of decay of the radioactive materials potentially cutting their half lives by a factor of 100 or more. Rolfs developed the technique after trying to recreate experimentally the way in which atomic nuclei react in the centre of stars. Whilst using a particle collider to carry out his studies, he noticed that more nuclear fusion reactions happened in the collider if the atomic nuclei were encased in metal and cooled. Fusion involves light nuclei coalescing to form heavier nuclei, releasing energy in the process. Radioactive decay is the opposite: a particle is released from a nucleus. Rolfs believes that if cooling nuclei in metal enhances fusion, it could enhance the opposite reaction, namely speeding up the rate at which radioactive particles decay. Can Germans speed up the radioactive decay? As physicsweb.org reports, Claus Rolfs et al. from University of Bochum used their local accelerator to speed up or slow down the fusion rate of individual protons, deuterons, and other light nuclei. The authors argue that if the particles are encased in metals, the process is faster than with insulators. Besides fusion, they have proposed a similar method to speed up the rate of both alpha and beta+- radioactive decay. Rolfs' explanation is based on electrons near the nuclei that accelerate positively charged particles towards the nuclei. Blah blah blah. I have very serious difficulties in believing this sort of stuff because the electrons can only give the particles electronVolts of energy while you need differences of order megaelectronVolts: electrons can simply be neglected in nuclear physics. In other words, the proposed mechanism and its problems seem equivalent to those of cold fusion. I am far from being the only one who believes that cold fusion is BS. In fact, even sonofusion is probably BS. For long-lived nuclei that decay via alpha-decay, the huge timescales come from the exponentials that we know from quantum tunnelling. Most of the barrier that the alpha particle needs to penetrate is unaffected by the electrons. So I am convinced that electrons, chemistry, and atomic physics can't cause any significant changes in the lifetimes of the elements and that their work is nonsense, despite their precious German nationality. But if I am missing something, I am sure that a reader will correct me. Such a discovery would have profound implications. The main problem with radioactive waste is its long lifetime. If you could significantly speed their decay up, that would make a huge political difference for nuclear power plants. I'm with the skeptics on this one. But even if Rolfs were correct, there would probably be a big practical problem with applying the method to radioactive waste. 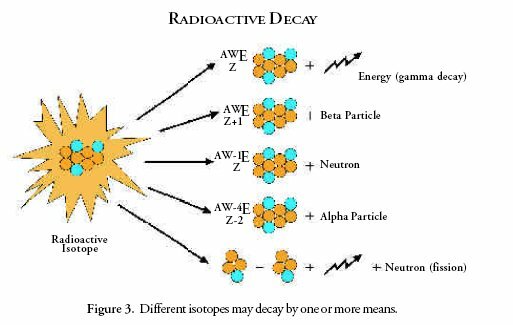 Accelerated radioactive decay would produce a considerable amount of heat. This does not sound consistent with maintaining the "ultra-low" temperatures said to be necessary for the process in the first place. Yikes. I knew Claus Rolfs from the 1970s. He is (was?) a very good physicist. I'm sorry to hear that he is now into crackpottery. There may well be a "hidden agenda" here with his "speeded up" radioactive decay: he is (was?) a "christian". ie he is (was?) a creationist. So radioactive dating is a problem if you think the earth is more than 6000 years old. I am sure this is right. Even nature increases the radioactive prowess of materials on its own. The age of Earth is not more than 5000 years & thus the theory of Uranium to lead dating cannot be true. The errors could be overlooking drastic atmospheric changes & natures own behaviour. there has been much work done on accelerated decay going back to the 1930s and every time some one actually does demonstrate it all the rest of the Physics world does is say OH NO YOU CAN'T DO THAT! WHY? Because what the hell is going on in a nuclear reactor? Any scientist that says it can't be done because it's written in some text book that it can't should not be a scientist! Radioactive dating? Dispels accelerated nuclear decay? What a crock of sh*t.
Where in the whole geologic history of Earth, was there a metal encased sub critical mass of uranium cooled to near absolute zero? For those nonscience buffs, absolute zero is the temperature at which particle motion is frozen, not to be confused with celsius zero "freezing point". Absolute Zero is an impossibly attained temperature, because there are always other atoms and particles moving in relation to the so nearly totally frozen atom. BUT scientists have nearly attained absolute zero. High density particles that have experienced existence in magma, or even been the core of a since nova star, have unimaginably fast moving nucleus, which pounds out gamma ray frequencies, which are capable of cooking people. What this Claus Rolfs proposes, is that we cool, those uranium and plutonium sub critical spent fuel nuggets, until they're not so active, thus not so hot. It may seem brilliant, on account of the corporate owned mass murderously educative University Level eSTABlishment has for years been teaching that it's impossible to cool radioactive material. It is though really quite OBVIOUS that radioactive material can be cooled. For example, spent fuel is cooler than fresh nuke fuel. The very notion that nuke fuel can not be cooled, especially when the simple experiment of cooling to absolute zero spent fuel has not been attempted, is a massive folly on the part of eSTABlishment academia and an intentional method to murder imposed by the top financial dominant, the fleshy man god of Earth, the emperor. I was one of the physicist working on those series of experiments at the Ruhr Universitaet of Bochum. C. Rolfs was my supervisor and with him we spent time, entire days (24h), entire weeks and about 2 years of hard work that produced my Ph.D. thesis on this argument. Then I will suggest you first read the articles connected to this experiments. Then you also read my thesis and then you can say BS. I'm not saying that the theory is 100% correct but it was the best representation of our experimental data. Different groups in Germany (Munchen University), Japan, China and others have analyzed the properties of embedded H atoms in metals with contrast results. As far as I know our experiment was the only one able to give a complete panoramic of almost all naturals bulk elements in the periodic table. In hopes of 'not insulting' anyone, there are many aspects of physics which are still undiscovered and will probably still be undiscovred until we achieve a level of understanding and comprehension worthy of their/its discovery. Each second, day, month, year and/or decade which passes accumulates more and more new data/ideas/theories to be pondered -- we are simply not ready to be BRILLIANT today!